Why Did Jesus Choose a Samaritan? Luke 10 contains Jesus’ Parable of the Good Samaritan. The basic message is that we are to love each person that crosses our path. The parable Jesus told contains an additional message that we might easily rush by. In the previous chapter (Luke 9) a Samaritan village refused to provide food and shelter for Jesus because he was traveling to Jerusalem. That sounds like prejudice at its finest. Jesus’ disciples then sought to return the favour as they asked if they could call down fire from heaven upon the village. Jesus rebuked them and walked on to another village. A little later when asked to answer the question “Who is my neighbour?” Jesus tells a story that contrasts the religious leaders of the day and a foreigner. If Jesus simply wanted to create a contrast for his story, he could have told the parable of the Good Undertaker, or the Good Tax Collector. He could have used any number of unclean or unwelcome characters from Jewish society. Instead, Jesus made his hero a Samaritan. In choosing a Samaritan as his hero Jesus provided a subversive commentary on Jewish societal attitudes of the day. So if you think Jesus wouldn’t have anything to say about race relations in the US (or any other country) today, you’re wrong. A significant message from this parable is that we are to love our neighbours that have black or white skin. We are to love those who speak English poorly, or not at all. Of course, none of us are racists. But there are some groups of people we don’t like very much. The (white) suburbs don’t like when the (black) city starts spreading outward. We complain aobut all the Indians in the call centers who we can’t understand. We don’t like the (sometimes illegal) immigrants taking “our jobs”. We’re uncomfortable driving through neighbourhoods where the store signs are all in another language. Maybe we don’t want to call down heavenly fire onto these people, but it would be a stretch to say that we love them. We need to respect the colour of skin, and the riches of languages and cultures of other people. We also need to look beyond these traits to their heart needs and their character. 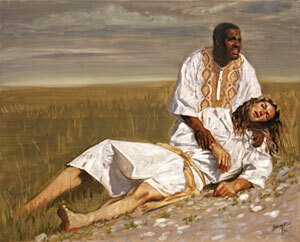 In The Parable of The Good Samaritan Jesus makes a subversive statement about race relations. “Samaritans are God’s people too.” It’s a message that retains its relevance in 2014. Living in South Africa has provided useful close-up experience of the Madiba phenomenon, providing both the observational aspect and the ‘feel’ of the situation, gained only by proximity. I was raised in an anti-nonwhite environment, but had enough contrary influences to provide an alternate view. Even my military duty experience exposed me to both sides of the prevalent prejudice: my studies exposed me to the official position on the banned organizations (such as Madiba’s ANC), their history, their goals, etc., while I experienced firsthand, because of my specific deployment, the conditions so many black South Africans live in. And in later years my ministry has taken me across many boundaries—economic, ethnic, educational, etc. Thus, still today, I hear and see and experience multiple aspects of life in South Africa. In other words, I have many years to draw on when expressing my opinion on this matter . . . I have not been totally sheltered from the realities of life in South Africa, which is, ironically, possible. Anybody who has spent even a small amount of time considering prejudice is aware that it dies hard; it is propagated, sadly, very effectively. Generations pass on prejudice even when trying to prevent it—our prejudices just sorta ooze out. This is one reason it is so vital to be transformed; our transformed selves will then ooze something else: whatever we’ve been transformed into. Jesus taught on this. Some special people over the millennia have modeled it. Nelson Rolihlahla Mandela was one such person. Since actions speak louder than words, Madiba’s demonstration of forgiveness and reconciliation has done much more than any person’s rhetoric to improve race relations. South Africa—the world, for that matter—has a long way to go to improve race relations. It will take the dedicated commitment of successive generations teaching their following generations—in words, but more importantly, through behaviour—to ‘play nice’ with people not like themselves. This is so much more possible in South Africa than in other countries, in my opinion, because of Madiba’s example. Those years in prison could have been used to nurture his hatred and resentment and desire for revenge. Or, as actually occurred, Madiba could choose to apply the principles of God: mercy, forgiveness, reconciliation . . . This is one clear example of God not being a respecter of persons—when someone applies God’s principles, whether such a person is saved or not, the results will come. This is stated slightly differently elsewhere, in the ‘sowing-and-reaping’ concept. Even farmers who do not believe God is in control of His creation reap if they apply sound agricultural principles. Nelson Mandela’s behavior applied, for instance, the godly principle of overcoming evil with good instead of paying back evil with evil (as per Rom. 12), in his demonstration of a generally conciliatory attitude. More than in a single event, this principle seems well captured in Madiba’s spoken and applied perspective not to seek retribution. This was, in my opinion, one of the telling influences preventing wide-spread acts of revenge on the white population once President Mandela was released, and especially after the elections of 1994 and the formation of the new government. While such acts took place, they were strongly denounced. The denouncements found widespread acceptance, it seems, because of Madiba’s speeches and actions upholding reconciliation. An example of this mindset–and the effect on the people–can be seen in how the movie “Invictus” portrayed Madiba putting together the security detail of the previous president and the men selected by the ANC to protect Madiba. This security group was a microcosm of the country: the new leader making the previous factions “play nice”. Apart from that aspect, Madiba was risking his life by bringing the previous enemy right to his side . . . he put his money where his mouth was by demonstrating forgiveness rather than firing that white security detail. For President Mandela to have chosen to respond as he did has given people across the spectrum the example, the motivation, the courage, the permission, to behave in a way that improves race relations in spite of whatever the specifics of their background are. They don’t even have to be God-followers. Now that Madiba has passed on, his legacy will be tested. If people continue to copy his example, many will benefit and his example will prove to have been powerfully influential. If his influence decreases with his passing, his example and legacy are not diminished. On the contrary: if in the absence of his remarkable example others fail to apply it, his response to his situation, which led to such a dramatic season of hope for race relations, will prove to be that much more remarkable, being so rare. Is It My Turn To Speak? Jason Whitlock writes headlines before he writes articles. He likes to get people’s attention. As an African-American sports journalist he often leverages his heritage to write from a “black perspective”. He commonly uses sports events as a basis for social commentary. With that said, I found one of his recent articles very interesting. You can read it HERE. If this country wants to really invest in young people, we must first invest in restoring the traditional family unit. As long as 68 percent of black women who have children are unwed, there are no cures for the social maladies preventing black progress. Much of the high-profile lawlessness and dysfunction we see in professional sports are a direct result of the impact of Hurricane Illegitimacy. It is not a coincidence that Bryant consistently struggles with his emotions and decision-making and [Calvin] Johnson does not. Johnson did not grow up amid chaos. He and his sister were raised by their married parents, who worked as a railroad conductor and an educator. Anyone familiar with my work realizes I do not shy away from discussing race. It’s an important, vital discussion. But so is the discussion of family. In many respects, the conversations go hand in hand. The man-made factors energizing Hurricane Illegitimacy unfairly and, in my opinion, intentionally impact the black and brown family structures. The drug war and mass incarceration are targeted at poor, dark-skin communities. I find his article compelling reading. As a minister in a multi-ethnic church I have members that fit this demographic. Young black women in the pews each week who experience the social pressure to start a family without a husband. To what extent is the pressure greater on these black women than the white women sitting next to them? Because they all face some pressure. Do we avoid the issues? Should we never mention that 68% of black women who have children are unwed? Or just teach other topics? Or just address it in private, maybe even segregated, forums? Do we treat everyone the same? Should we pretend that every member, urban and suburban, faces the same pressures? Do we just lay it out there and let the chips fall where they may? Of course no one would set out to be offensive, but should a white leader discuss this issue as sensitively as he can even though in all likelihood it will upset some? Do we find a black leader to address the topic? Does the race of the speaker make a difference? Should this make a big difference? On the one hand it’s a family dysfunction problem. On the other hand, it’s a family dysfunction problem that’s more prevalent (not uniquely prevalent) within the black community. Can multi-ethnic churches address one issue without addressing the other? Without being specific Whitlock demonstrates the difference between racial and cultural issues. He compares Dez Bryant and Calvin Johnson. They are both super-talented, young, black, wide receivers playing in the NFL. However, their family upbringing is so disparate that it’s not fair to compare their personalities just because they play the same position or share the same race. The culture (or sub-culture if you prefer) that influenced them is completely opposite. Johnson was raised in an environment that valued citizenship and education. In contrast, it’s a miracle that Bryant avoided the life of crime and drug addiction to which his mother succumbed. All at once the issue is racial, but also cultural. Church leaders need to be vigilant not to assume that because people have one trait in common they have all traits in common. For the 68% of unwed mothers there’s also 32% who are married. Who are you speaking to? Leading a multi-ethnic church requires knowing your members more than your statistics.